Parcheta’s research endeavors were recently honored in National Geographic‘s Expedition Granted campaign, which awards $50,000 to the next “great explorer.” Parcheta was a finalist, and was voted number 2 by online participants for her research proposal for exploring volcanoes with robots. Jupiter’s moons are putting on an amazing show this month. The orbital path of the moons is tilting edge-on to Earth and the sun. This lineup makes it possible to watch the moons pass in front of each other and even eclipse each other with their shadows. Get all the details, including where to find Jupiter in the sky this month, in this edition of What’s Up. The new study is the first to devise a way to make apples-to-apples comparisons of carbon dioxide estimates from many sources at different scales: computer models of ecosystem processes, atmospheric models run backward in time to deduce the sources of today’s concentrations (called inverse models), satellite images, data from experimental forest plots and more. The researchers reconciled all types of analyses and assessed the accuracy of the results based on how well they reproduced independent, ground-based measurements. They obtained their new estimate of the tropical carbon absorption from the models they determined to be the most trusted and verified. As human-caused emissions add more carbon dioxide to the atmosphere, forests worldwide are using it to grow faster, reducing the amount that stays airborne. This effect is called carbon fertilization. “All else being equal, the effect is stronger at higher temperatures, meaning it will be higher in the tropics than in the boreal forests,” Schimel said. But climate change also decreases water availability in some regions and makes Earth warmer, leading to more frequent and larger wildfires. 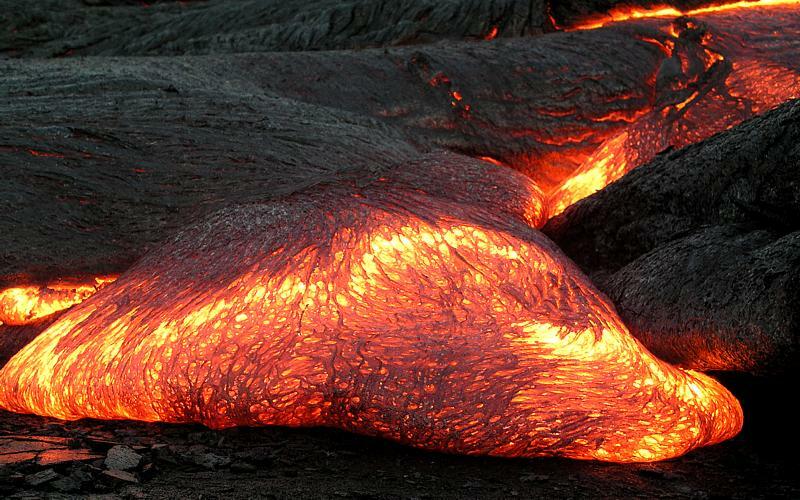 In the tropics, humans compound the problem by burning wood during deforestation. Fires don’t just stop carbon absorption by killing trees, they also spew huge amounts of carbon into the atmosphere as the wood burns. In the mid-2000s, Stephens used measurements of carbon dioxide made from aircraft to show that many climate models were not correctly representing flows of carbon above ground level. Models that matched the aircraft measurements better showed more carbon absorption in the tropical forests. 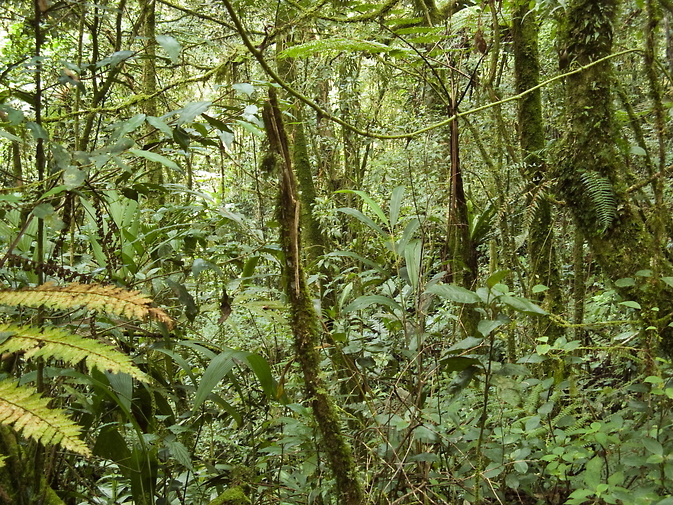 However, there were still not enough global data sets to validate the idea of a large tropical-forest absorption. Schimel said that their new study took advantage of a great deal of work other scientists have done since Stephens’ paper to pull together national and regional data of various kinds into robust, global data sets. Scheduled for launch on Jan. 29, 2015, NASA’s Soil Moisture Active Passive (SMAP) instrument will measure the moisture lodged in Earth’s soils with an unprecedented accuracy and resolution. The instrument’s three main parts are a radar, a radiometer and the largest rotating mesh antenna ever deployed in space. Remote sensing instruments are called “active” when they emit their own signals and “passive” when they record signals that already exist. The mission’s science instrument ropes together a sensor of each type to corral the highest-resolution, most accurate measurements ever made of soil moisture — a tiny fraction of Earth’s water that has a disproportionately large effect on weather and agriculture. To enable the mission to meet its accuracy needs while covering the globe every three days or less, SMAP engineers at NASA’s Jet Propulsion Laboratory in Pasadena, California, designed and built the largest rotating antenna that could be stowed into a space of only one foot by four feet (30 by 120 centimeters) for launch. The dish is 19.7 feet (6 meters) in diameter. “We call it the spinning lasso,” said Wendy Edelstein of NASA’s Jet Propulsion Laboratory, Pasadena, California, the SMAP instrument manager. Like the cowboy’s lariat, the antenna is attached on one side to an arm with a crook in its elbow. It spins around the arm at about 14 revolutions per minute (one complete rotation every four seconds). The antenna dish was provided by Northrop Grumman Astro Aerospace in Carpinteria, California. The motor that spins the antenna was provided by the Boeing Company in El Segundo, California. “The antenna caused us a lot of angst, no doubt about it,” Edelstein noted. Although the antenna must fit during launch into a space not much bigger than a tall kitchen trash can, it must unfold so precisely that the surface shape of the mesh is accurate within about an eighth of an inch (a few millimeters). SMAP’s radar, developed and built at JPL, uses the antenna to transmit microwaves toward Earth and receive the signals that bounce back, called backscatter. The microwaves penetrate a few inches or more into the soil before they rebound. Changes in the electrical properties of the returning microwaves indicate changes in soil moisture, and also tell whether or not the soil is frozen. 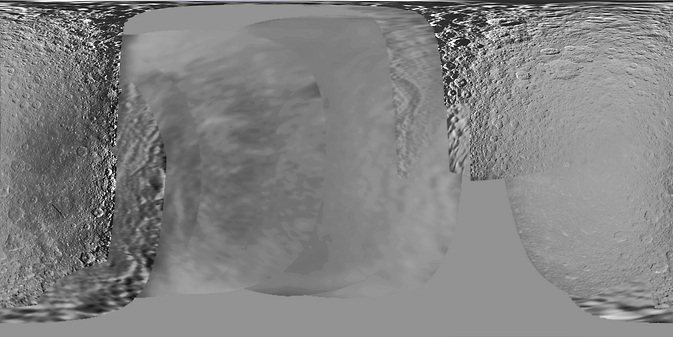 Using a complex technique called synthetic aperture radar processing, the radar can produce ultra-sharp images with a resolution of about half a mile to a mile and a half (one to three kilometers). SMAP’s radiometer detects differences in Earth’s natural emissions of microwaves that are caused by water in soil. To address a problem that has seriously hampered earlier missions using this kind of instrument to study soil moisture, the radiometer designers at NASA’s Goddard Space Flight Center, Greenbelt, Maryland, developed and built one of the most sophisticated signal-processing systems ever created for such a scientific instrument. The problem is radio frequency interference. The microwave wavelengths that SMAP uses are officially reserved for scientific use, but signals at nearby wavelengths that are used for air traffic control, cell phones and other purposes spill over into SMAP’s wavelengths unpredictably. Conventional signal processing averages data over a long time period, which means that even a short burst of interference skews the record for that whole period. The Goddard engineers devised a new way to delete only the small segments of actual interference, leaving much more of the observations untouched. SMAP will be the fifth NASA Earth science mission launched within the last 12 months. NASA monitors Earth’s vital signs from space, air and land with a fleet of satellites and ambitious airborne and ground-based observation campaigns. NASA develops new ways to observe and study Earth’s interconnected natural systems with long-term data records and computer analysis tools to better see how our planet is changing. The agency shares this unique knowledge with the global community and works with institutions in the United States and around the world that contribute to understanding and protecting our home planet. Any way you slice it, space exploration — done right — requires an inordinate range of technical expertise. From designing the spacecraft, the mission proposal and the circuit boards to testing the flight software and putting together budgets, sending something, anything, into the cosmos depends on good people who know their job. Only three years after receiving her graduate degree in engineering, and having logged time in JPL’s Environmental Test Lab, Statham was chosen to become the project manager for NASA’s Radiometer Atmospheric CubeSat Experiment (RACE) mission. The position quickly provided the Georgia Institute of Technology grad all the hands-on experience she could have hoped for — and more. 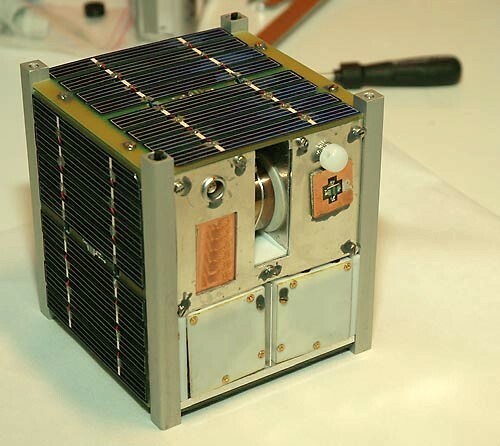 RACE was a CubeSat, a small satellite no bigger than a loaf of bread, designed to test components of an Earth-observing radiometer that would be used in future missions by larger, more expensive satellites. RACE was designed to “hitch a ride” aboard a rocket that was already tasked with lofting a spacecraft to the International Space Station. Once at the station, RACE would be set free to orbit Earth as its own satellite, measuring the liquid water path and water vapor that is pertinent to the water cycle and Earth’s energy budget from 240 miles up. When compared to its larger satellite siblings, just about everything about CubeSats is diminutive. Even transporting them is low-key. While their bigger brethren usually require a specially-equipped, air-cushioned tractor trailer or perhaps a military cargo plane, RACE made its way from the lab into the world via an attaché-sized box that Statham herself placed in the overhead compartment above her airliner seat. The RACE team had hoped to show their instrument’s performance could rival that of traditional big satellites, resulting in potential cost savings down the line. On the evening of October 28, 2014, Statham and several other RACE early career hires watched as an Antares rocket carrying their satellite lifted off from the Wallops Flight Facility in Virginia. Moments into the flight, one of the rocket’s main engines failed, sending its space station-destined payload (including RACE) to a fiery end. Statham is sticking with CubeSats for the time being. She is working on a JPL concept to fly a space-based radar called “RaInCube.” Others on her team have gone on to other CubeSat projects, while still others are working on more traditional space missions or in one of the research labs at JPL. And what of RACE itself? At the time of this writing, the 13.4-inch-long (34-centimeter) spacecraft has not been recovered. But the technology that Statham and her colleagues pushed from concept, to test bed, to launch pad, lives on. The lessons learned developing the radiometer, the instrument that was the heart of the RACE mission, are being applied to a new CubeSat proposal called Temporal Experiment for Storms and Tropical Systems – Demonstrator (TEMPEST-D). The next JPL CubeSat is scheduled to fly on January 29 of next year. Called GEO-CAPE ROIC In-Flight Performance Experiment (GRIFEX), the CubeSat will hitch a ride aboard the Soil Moisture Active-Passive (SMAP) launch from Vandenberg Air Force Base, California. GRIFEX is a flight test of advanced technology required for future Earth observers measuring atmospheric composition from geostationary Earth orbit. JPL has other CubeSat projects in development as well, including missions to the moon, Mars and near-Earth asteroids. JPL recently selected proposals from 10 universities to analyze CubeSat concepts that could enhance a proposed Europa Clipper mission. The concepts will be incorporated into a JPL study on how small probes could be carried as auxiliary payloads. NuSTAR is a Small Explorer mission led by Caltech and managed by NASA’s Jet Propulsion Laboratory, also in Pasadena, for NASA’s Science Mission Directorate in Washington. The spacecraft was built by Orbital Sciences Corporation, Dulles, Virginia. 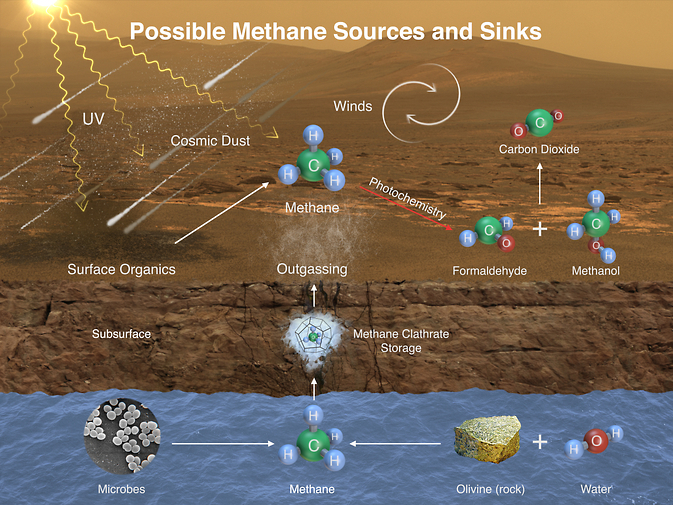 Its instrument was built by a consortium including Caltech; JPL; the University of California, Berkeley; Columbia University, New York; NASA’s Goddard Space Flight Center, Greenbelt, Maryland; the Danish Technical University in Denmark; Lawrence Livermore National Laboratory, Livermore, California; ATK Aerospace Systems, Goleta, California; and with support from the Italian Space Agency (ASI) Science Data Center. The first global maps of atmospheric carbon dioxide from NASA’s new Orbiting Carbon Observatory-2 mission demonstrate its performance and promise, showing elevated carbon dioxide concentrations across the Southern Hemisphere from springtime biomass burning. At a media briefing today at the American Geophysical Union meeting in San Francisco, scientists from NASA’s Jet Propulsion Laboratory, Pasadena, California; Colorado State University (CSU), Fort Collins; and the California Institute of Technology, Pasadena, presented the maps of carbon dioxide and a related phenomenon known as solar-induced chlorophyll fluorescence and discussed their potential implications. “Preliminary analysis shows these signals are largely driven by the seasonal burning of savannas and forests,” said OCO-2 Deputy Project Scientist Annmarie Eldering, of JPL. The team is comparing these measurements with data from other satellites to clarify how much of the observed concentration is likely due to biomass burning. The time period covered by the new maps is spring in the Southern Hemisphere, when agricultural fires and land clearing are widespread. The impact of these activities on global carbon dioxide has not been well quantified. As OCO-2 acquires more data, Eldering said, its Southern Hemisphere measurements could lead to an improved understanding of the relative importance in these regions of photosynthesis in tropical plants, which removes carbon dioxide from the atmosphere, and biomass burning, which releases carbon dioxide to the atmosphere. 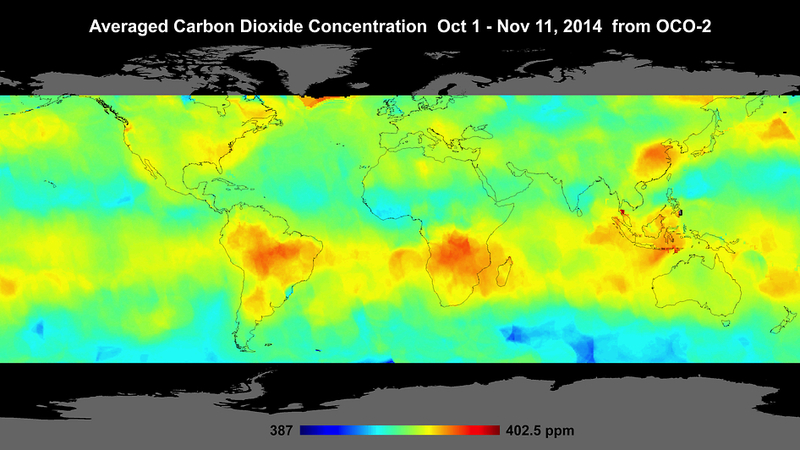 Carbon dioxide in the atmosphere has no distinguishing features to show what its source was. Elevated carbon dioxide over a region could have a natural cause — for example, a drought that reduces plant growth — or a human cause. At today’s briefing, JPL scientist Christian Frankenberg introduced a map using a new type of data analysis from OCO-2 that can help scientists distinguish the gas’s natural sources. Through photosynthesis, plants remove carbon dioxide from the air and use sunlight to synthesize the carbon into food. Plants end up re-emitting about one percent of the sunlight at longer wavelengths. Using one of OCO-2’s three spectrometer instruments, scientists can measure the re-emitted light, known as solar-induced chlorophyll fluorescence (SIF). This measurement complements OCO-2’s carbon dioxide data with information on when and where plants are drawing carbon from the atmosphere. “Where OCO-2 really excels is the sheer amount of data being collected within a day, about one million measurements across a narrow swath,” Frankenberg said. 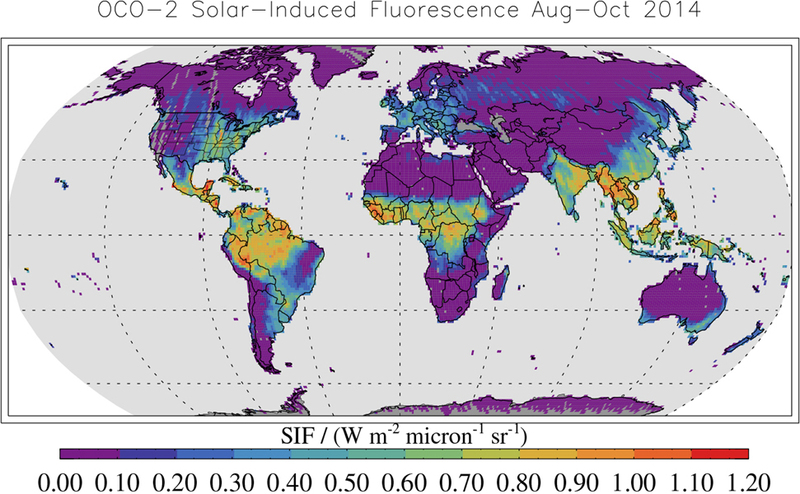 “For fluorescence, this enables us, for the first time, to look at features on the five- to 10-kilometer scale on a daily basis.” SIF can be measured even through moderately thick clouds, so it will be especially useful in understanding regions like the Amazon where cloud cover thwarts most spaceborne observations. 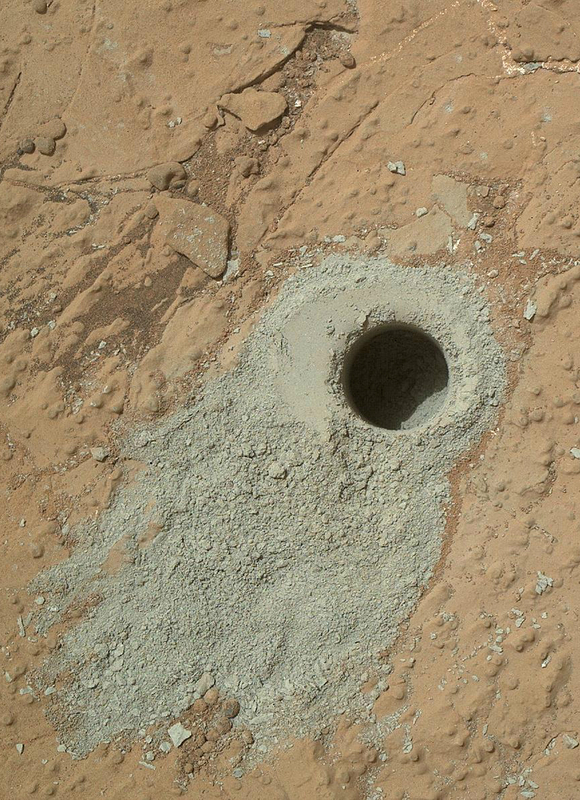 “It’s really interesting that our measurements from Curiosity of gases extracted from ancient rocks can tell us about loss of water from Mars,” said Paul Mahaffy, SAM principal investigator of NASA’s Goddard Space Flight Center in Greenbelt, Maryland, and lead author of a report published online this week by the journal Science. “This remarkable event raises questions that will stimulate new studies of the nature of shocks in the interstellar medium,” said Leonard Burlaga, astrophysicist emeritus at NASA Goddard Spaceflight Center in Greenbelt, Maryland, who analyzed the magnetic field data that were key to these results. It is unclear to researchers what the unusual longevity of this particular wave may mean. They are also uncertain as to how fast the wave is moving or how broad a region it covers. The second tsunami wave helped researchers determine in 2013 that Voyager 1 had left the heliosphere, the bubble created by the solar wind encompassing the sun and the planets in our solar system. Denser plasma “rings” at a higher frequency, and the medium that Voyager flew through, was 40 times denser than what had been previously measured. This was key to the conclusion that Voyager had entered a frontier where no spacecraft had gone before: interstellar space. JPL, a division of Caltech, built the twin Voyager spacecraft and operates them for the Heliophysics Division within NASA’s Science Mission Directorate in Washington. Almost immediately after NASA’s twin Voyager spacecraft made their brief visits to Saturn in the early 1980s, scientists were hungry for more. The Voyagers had offered them only a brief glimpse of a family of new worlds — Saturn’s icy moons — and the researchers were eager to spend more time among those bodies. The successor to the Voyagers at Saturn, NASA’s Cassini spacecraft, has spent the past 10 years collecting images and other data as it has toured the Ringed Planet and its family of satellites. 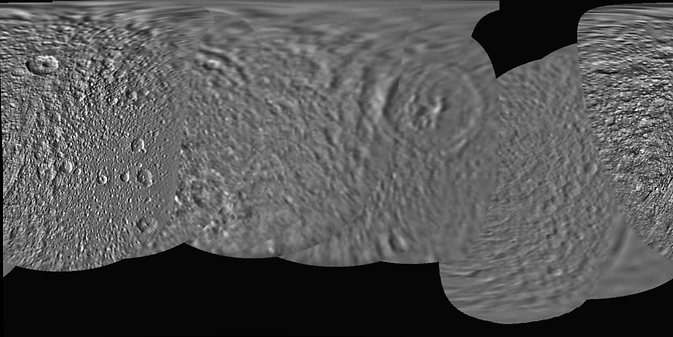 New color maps, produced from this trove of data, show that Cassini has essentially fulfilled one of its many mission objectives: producing global maps of Saturn’s six major icy moons. These are the large Saturnian moons, excluding haze-covered Titan, known before the start of the Space Age: Mimas, Enceladus, Tethys, Dione, Rhea and Iapetus. 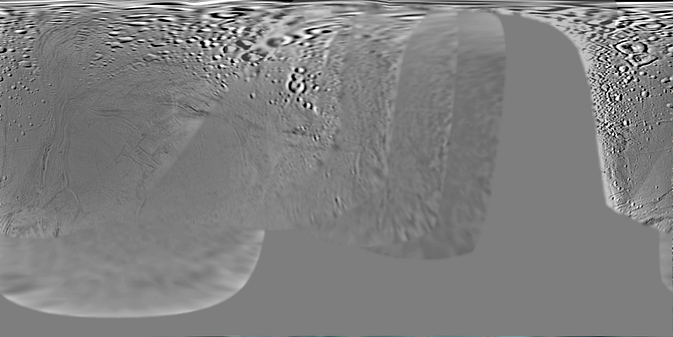 Aside from a gap in the north polar region of Enceladus (to be filled in next year), and some areas of Iapetus, this objective is now more or less complete. 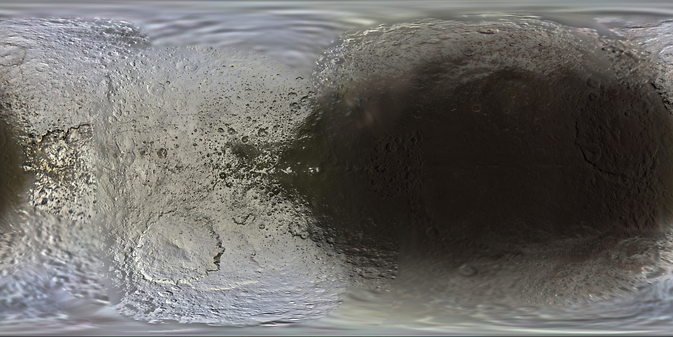 The new maps are the best global, color maps of these moons to date, and the first to show natural brightness variations and high-resolution color together. Colors in the maps represent a broader range than human vision, extending slightly into infrared and ultraviolet wavelengths. 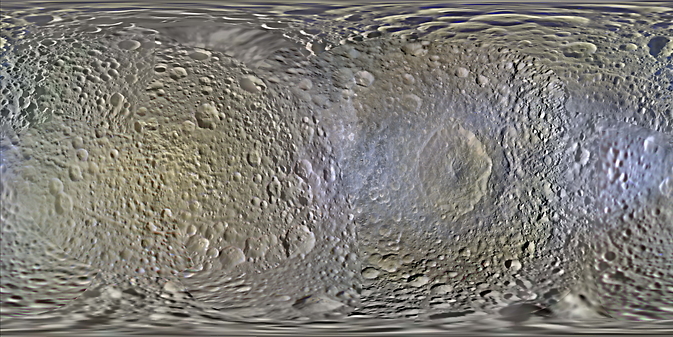 Differences in color across the moons’ surfaces that are subtle in natural-color views become much easier to study in these enhanced colors. 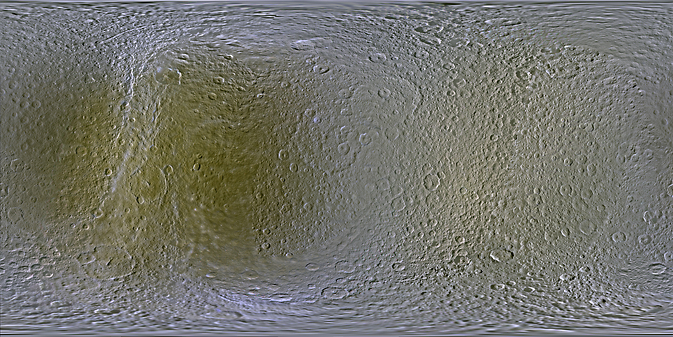 Cassini’s enhanced color views have yielded several important discoveries about the icy moons. 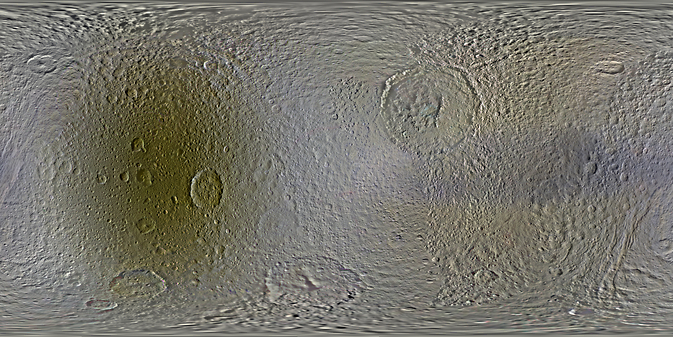 The most obvious are differences in color and brightness between the two hemispheres of Tethys, Dione and Rhea. The dark reddish colors on the moons’ trailing hemispheres are due to alteration by charged particles and radiation in Saturn’s magnetosphere. 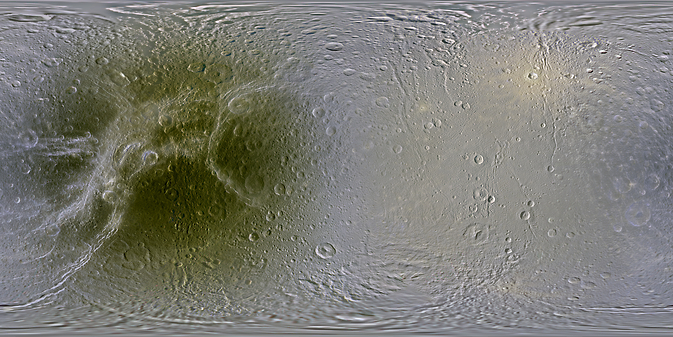 Except for Mimas and Iapetus, the blander leading hemispheres of these moons — that is, the sides that always face forward as the moons orbit Saturn — are all coated with icy dust from Saturn’s E-ring, formed from tiny particles erupting from the south pole of Enceladus. 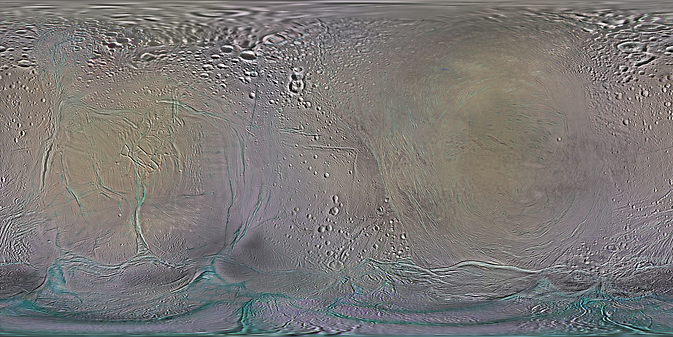 Enceladus itself displays a variety of colorful features. 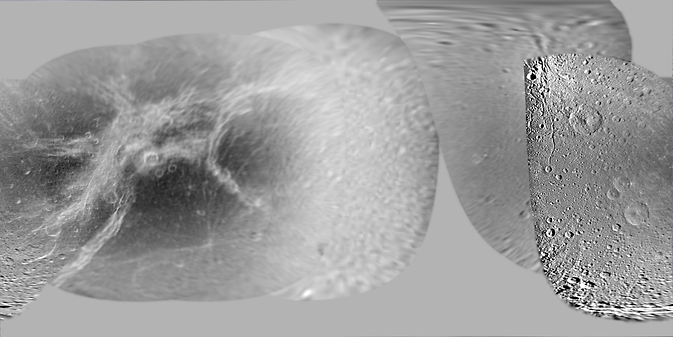 Some of the gas and dust being vented into space from large fractures near the moon’s south pole returns to the surface and paints Enceladus with a fresh coating. The yellow and magenta tones in Cassini’s color map are thought to be due to differences in the thickness of these deposits. 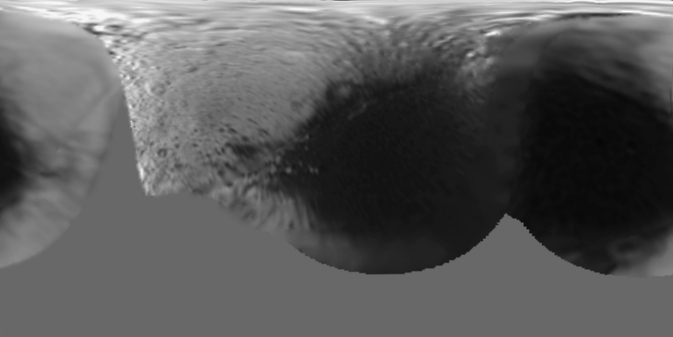 Many of the most recently formed fractures on Enceladus, those near the south pole in particular, have a stronger ultraviolet signature, which appears bluish in these maps. Their color may be due to large-grained ice exposed on the surface, not unlike blue ice seen in some places in Earth’s Arctic. 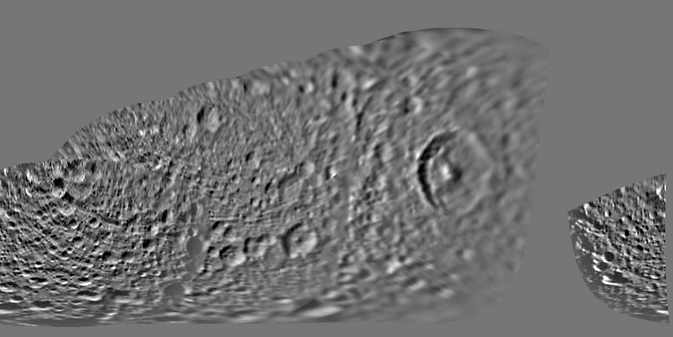 The new maps were produced by Paul Schenk, a participating scientist with the Cassini imaging team based at the Lunar and Planetary Institute in Houston. The Cassini-Huygens mission is a cooperative project of NASA, the European Space Agency and the Italian Space Agency. The Jet Propulsion Laboratory in Pasadena, California, manages the Cassini and Voyager missions for NASA’s Science Mission Directorate in Washington. The two Voyager spacecraft and the Cassini orbiter, along with its two onboard cameras, were designed, developed and assembled at JPL. The Cassini imaging team consists of scientists from the United States, England, France and Germany. The imaging team is based at the Space Science Institute in Boulder, Colorado.